BIOLOGY CENTRE CAS | A new study by parasitologists was chosen by the prestigious journal Current Biology as a featured article. A new study by parasitologists was chosen by the prestigious journal Current Biology as a featured article. How an evolutionary conserved protein complex works in mitochondria, the powerhouses of eukaryotic cells, was published by researchers at Biology Center AS CR in the prestigious journal Current Biology. The editorial board selected the study as a featured article that is freely available to readers. Mitochondria are famously known in the textbooks as the powerhouses of eukaryotic cells, a group of organisms that include us, mushrooms and plants. These organelles have a complex architecture, being made up of two membranes with the self-descriptive names outer and inner membrane. These define two compartments within the mitochondria: the intermembrane space between the two membranes and the matrix surrounded by the inner membrane. In contrast to the outer membrane, the inner membrane has a quite elaborate structure. It is folded into finger-like projections that extend into the matrix called cristae. Cristae are the location protein complexes (a collection of proteins, in which each represents a vital part of a working molecular machine) that allow eukaryotes to breathe oxygen, a vital process for generating energy for the whole cell. Mitochondria are ancient organelles of eukaryotes, cristae are ancient characters of the organelle and the protein complexes that provide the machinery for respiration are ancient features on cristae. All are found throughout diverse eukaryotes such as us, mushrooms and plants. They are also found in single-cell eukaryotes called protists. Belonging to this diverse and fascinating group of organisms is the causative agent of sleeping sickness, the flagellate called Trypanosoma brucei. In the Current Biology article by Iosif Kaurov and colleagues, we set out to answer the following questions: what are the shared parts of the machinery that build cristae throughout eukaryotes and what parts of this machinery are different so that suits the containing eukaryote’s specific respiration needs? T. brucei was used in this study since it has a well-developed genetic toolbox, developed by researchers trying to find ways to specifically kill the pathogen, to allow us to dissect the machinery responsible for cristae shaping. The name of the machine that was the focus of our study is MICOS (mitochondrial contact site and cristae organization system). In yeast (a close relative of mushrooms) and human (which we’ll collectively call “yuman”), it is known that this protein complex generates sites in which the inner and outer membranes to come into close contact with each other and also attach cristae to the rest of the inner membrane. If the yuman MICOS machine is broken, cristae detach from inner membrane and float in the matrix. Only a single gene for one protein piece of yuman MICOS was found in T. brucei. Like pulling the visible handle of a drawer to see what is inside, we were able to use this information to isolate the whole MICOS protein complex from T. brucei cells by a method called co-immunoprecipitation. We were then able to what its similarities and differences are in comparison to yuman MICOS. We found that the inner and outer membrane contact site and cristae attachment to the inner membrane functions were the same between the T. brucei and yuman. 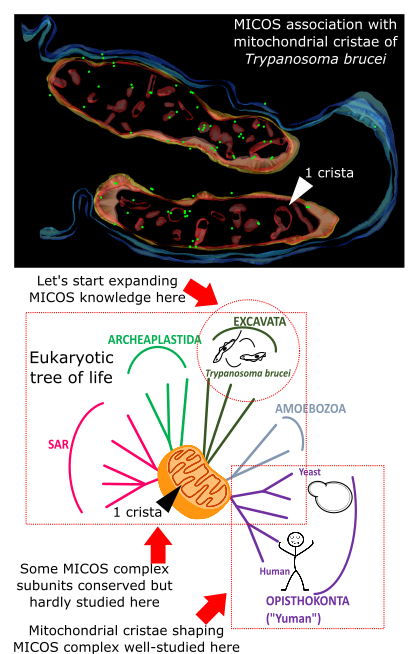 Because these two types of organisms are about as distant eukaryotic relatives as can be possibly examined, we can conclude that this role of MICOS is a fundamental one throughout eukaryotes. We also were able to directly observe the MICOS complex on the mitochondrial cristae and also the consequence of genetically removing MICOS on the shape of cristae thanks to the electron microscopy facility here at the Biology Center. But the differences were surprising. Besides that lone recognizable protein of MICOS, the other pieces are very different from those that make up the yuman machine. Furthermore, one of the pieces seems to have a different role than any known so far yuman MICOS. This part helps to capture proteins that belong in the intermembrane space. Among proteins that go to the intermembrane space are little proteins that are a part of or help to build the protein complexes that are part of the respiratory chain that reside in cristae. Therefore we demonstrate that T. brucei MICOS not only helps to give cristae their shape, but also help to place the protein machinery in this part of the mitochondria that is responsible for respiration in T. brucei. The open question now is whether T. brucei MICOS is the exception in playing this role or yuman MICOS is in not having such a protein.